The "Vidmaster" set of achievements found in Halo 3. An Achievement is a reward given to players when they accomplish certain gaming feats decided by the developer in videogames published for Games for Windows Live and the Xbox 360 and the Xbox One consoles. Since the launch of the Xbox 360, it has been a mandatory requirement by Microsoft that all videogames published on the console (including 360 versions of multiplatform games) feature Achievements. Most Achievements also award the player Gamerpoints that count towards a gamer's total Gamerscore. These points, while not redeemable, are intended to serve as a tangible form of special rewards for unusual or skilled actions within game play. Most games contain 30-50 Achievements and a total of 1000 Gamerscore, though these numbers can be increased through the release of DLC packs. On the Xbox 360 and Windows platforms, achievements take the appearance of icons or badges, not unlike the medals which can be found in the Halo games. In contrast to the original small, square achievement icons, Xbox One achievements are represented by large 16x9 images. Rather than icons, these images are often screenshots, concept art, or other related imagery. These images may or may not include additional text, such as the name of the title or a developer logo. The PC version of Halo 2 was the first Halo game to contain Achievements. Since Halo 2 was released on the original Xbox, the Achievement system had not yet been invented. However, Achievements were added to the release of Halo 2 as a game for Windows. There are 41 achievements. In Halo 3, there are currently 79 Achievements to unlock, worth a total of 1,750 Gamerscore. Halo 3 was originally released with 49 Achievements, worth the standard 1,000 Gamerscore, but an additional 30 were added dealing with new downloadable content, four of which were part of the Road to Recon challenge. 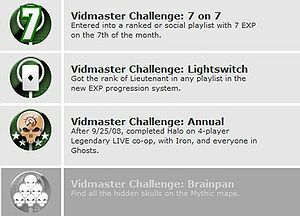 The completion of these achievements, called the Vidmasters, plus the last three in Halo 3: ODST would unlock the Recon armor for player models in multiplayer. Various achievements unlock armor permutations. 58 Achievements appear in Halo Wars, worth 1200 Gamerscore points in total. All of these Achievements are listed below. All Achievements in Halo 3: ODST are listed below. Unlike the Achievements from Halo 3, the actions required by several Achievements in ODST must be completed on specific levels in order to count. For example, the I Like Fire Achievement can only be unlocked on the Data Hive level. There are three Vidmaster challenges to complete in this game, and if these three achievements and the remaining four in Halo 3 are completed, the Recon armor is unlocked for player models in multiplayer. Tayari Plaza • Uplift Reserve • Kizingo Boulevard • ONI Alpha Site • NMPD HQ • Kikowani Station • Data Hive • Coastal Highway • Campaign Complete: Normal • Campaign Complete: Heroic • Campaign Complete: Legendary • Listener • Tuned In • All Ears • Audiophile • Tourist • Heal Up • Junior Detective • Gumshoe • Super Sleuth • Wraith Killer • Both Tubes • Laser Blaster • Dome Inspector • I Like Fire • Naughty Naughty • Good Samaritan • Headcase • Trading Down • Dark Times • My Clothes! • Boom, Headshot • Pink and Deadly • Ewww, Sticky • Stunning! It is worth noting that Halo Waypoint has no achievements in and of itself. This is likely due to the fact that because Waypoint contains no original gameplay, any Achievements granted by it would just be rewarding players again for accomplishments they had already completed. Waypoint instead has Avatar Awards, achievable and viewable simply by accessing Waypoint after carrying out certain tasks in the various Halo games. In Halo: Reach, there are 69 achievements worth 1700 Gamerscore in total. Like Halo 3, there were originally 49 achievements and 1000 Gamerscore before the release of the Noble Map Pack and Defiant Map Pack, which added 10 achievements and 400 gamerpoints to the list. An additional three achievements were released for the Defiant Map Pack alongside the release of the Anniversary Map Pack which also included another seven achievements, for a final 300 gamerscore. Achievements in Halo: Reach also earn the player credits in the game. Both Barrels • Cross-Mappin' • Offensive Driver • Poppin' & Lockin' • Totally Worth It • You Ate All the Chips • You Blew It Up! In Halo: Combat Evolved Anniversary, there are 44 achievements worth 1000 Gamerscore in total. In Halo 4, there are 86 achievements worth 2000 Gamerscore in total. Like Halo 3 and Halo: Reach, there were originally 49 achievements and 1000 Gamerscore before the release of the Crimson Map Pack, which added 8 achievements and 250 Gamerpoints to the list. 19 additional achievements and 500 Gamerpoints were released along the Majestic Map Pack and Castle Map Pack. The Champions Bundle included 10 achievements and 250 Gamerpoints, giving Halo 4 both the greatest number of achievements and highest Gamerscore of any Halo title. Digging up the Past • Midnight Launch • This is my Rifle, this is my Gun • Bros to the Close • Mortardom • Explore the Floor • Give Him the Stick • Chief, Smash! What is Yours is Also Mine • Dodge This! • Hello Nurse! • That Won't Save You • Ashes to Ashes • Beating Up the Beat • Sight Seeing • Scrapyard • Outta My Way! Protect This House • Hat Trick • From Downtown • Repeat Survivor • Can't Catch Me • Just a Scratch • Pitchin' a Tent • One Man Army • Shocking • Got it! In Halo: Spartan Assault, there are 20 achievements worth 200 Gamerscore for Windows Phone and Windows 8, 28 achievements and 400 Gamerscore for Xbox 360, and 30 achievements and 1000 Gamerscore for Xbox One. In Halo: The Master Chief Collection, there is a total of 600 achievements worth 6000 Gamerscore, more than any previous Halo game. For the full list, click the link above. Bloody Thirsty! • Thirst Locked Down! • Rule Your Thirst! • High Altitude Thirst! • Worship Your Thirst! • Gate Your Thirst! • BLASTacular! • Monumental Thirst! In Halo: Spartan Strike, there is a total of 20 achievements worth 200 Gamerpoints. In Halo 5: Guardians, there is a total of 73 achievements worth 1250 Gamerpoints. In Halo 5: Forge, there are a total of 22 achievements worth 1000 gamerpoints. In Halo Wars: Definitive Edition, there are a total of 75 achievements worth 1500 Gamerpoints. In Halo Wars 2, there are a total of 60 achievements worth 1000 Gamerpoints. Freeze! • Insult upon injury • Nothing too difficult, then? Piggyback! • That sweet smell of home • You met me on Reach!